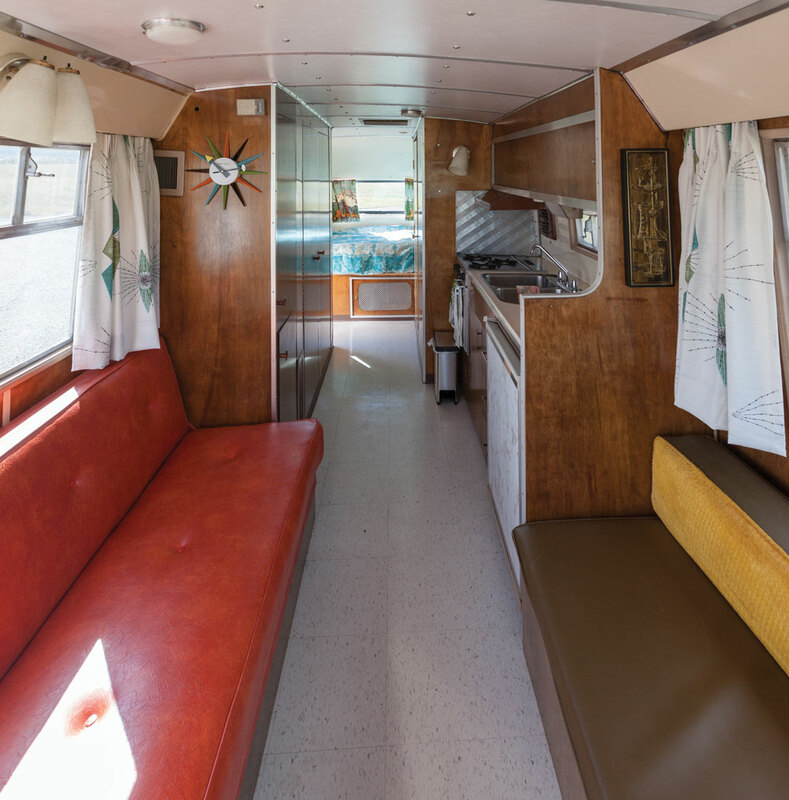 An eclectic couple in Bankview walks the line between mid-century modernism and postmodern design, but when it comes to their 1963 Dodge Travco Travelhome, Myrtle, anything goes. The home of Capri Rasmussen and Jason Auch is exactly 17 feet wide. While that might not seem big enough for two people with a penchant for collecting, all you have to do is look up. 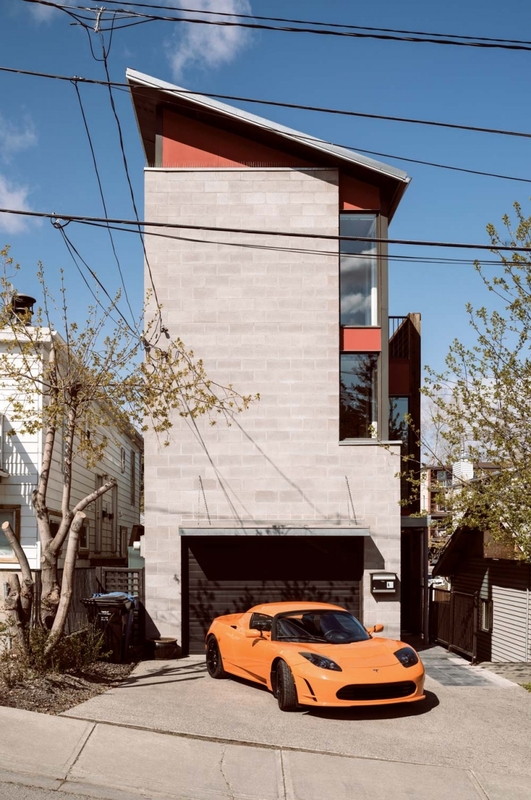 The three-storey (plus walkout basement) Bankview infill home may look ultra-modern on the outside, especially when Auch’s Tesla is parked out front, but, on the inside, it is a mid-century modernist’s dream. These two are collectors, curators and even scavengers at times. 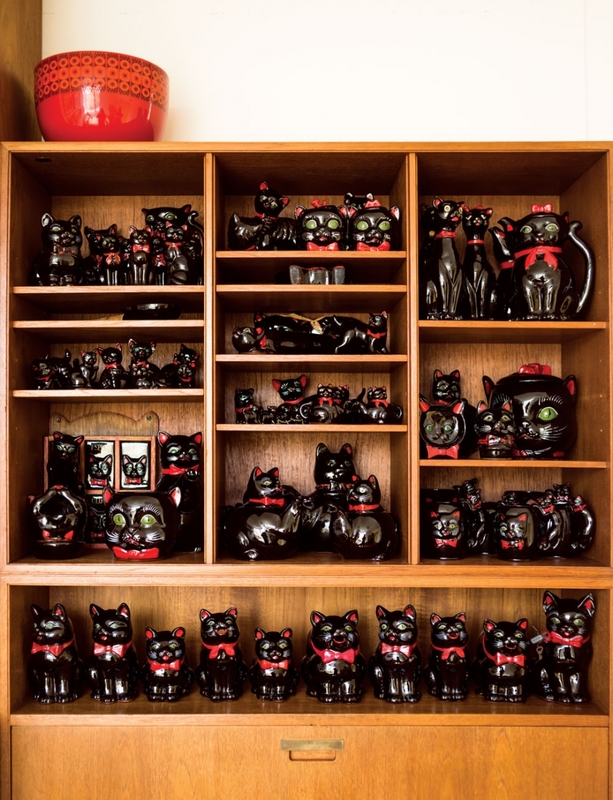 Rasmussen began her love of collecting at just 12 years old when she discovered 1950s Japanese Shafford black cats. Her now-expansive collection lives in the couple’s guest bedroom; she adds to it only when she finds the perfect cat. 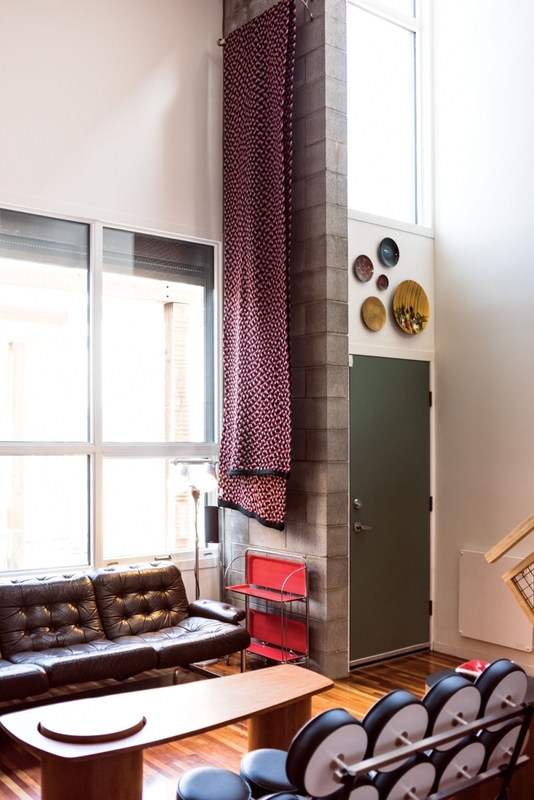 Small, quirky touches give the home enormous character, delightfully playing against its industrial structure. 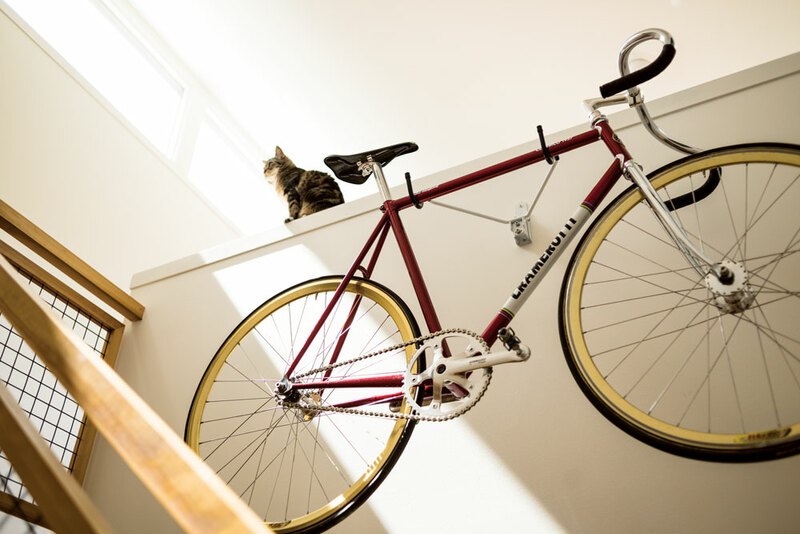 A racing bicycle hangs in the tall stairwell hallway alongside antique tapestries, while the warmth of a teak dining table juxtaposes against a minimalist concrete wall. 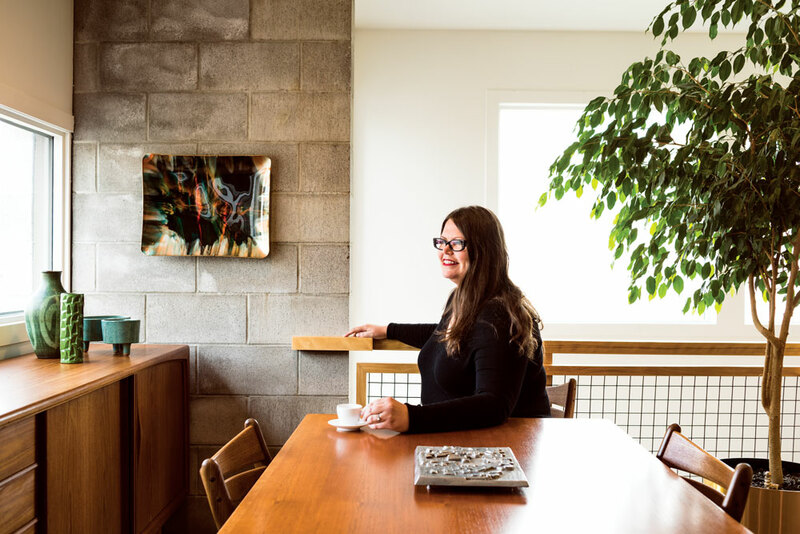 Rasmussen and Auch are both avid vegans and love to cook, so it is no secret that the most-loved room in their home is the kitchen. A bright and airy room, with lots of natural light flowing in through the nearly wall-to-wall windows, the kitchen is filled with artwork and sentimental objects that bring importance to the space. 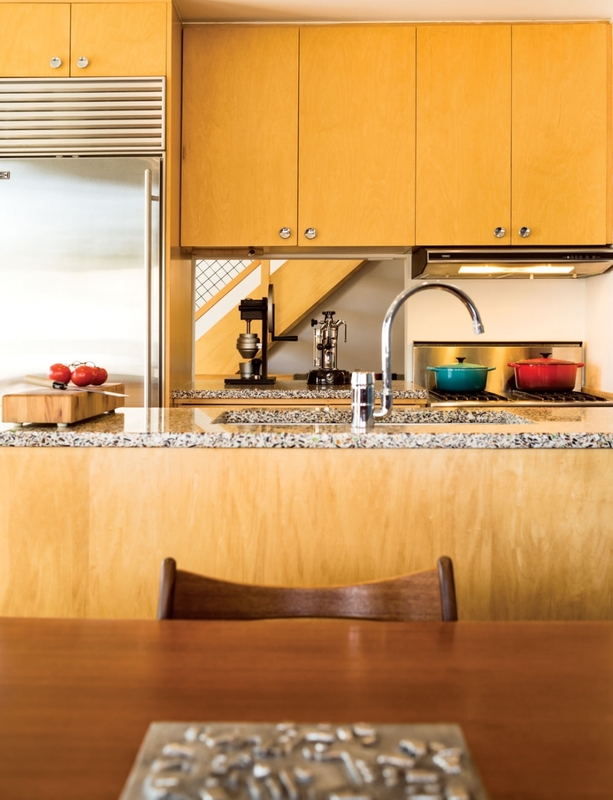 The couple played with textures and mixed eras when they designed and decorated their kitchen – the countertop is made with recycled glass, while the Danish modern credenza and dining table, both lucky purchases on eBay, nod to the couple’s penchant for mid-century design. 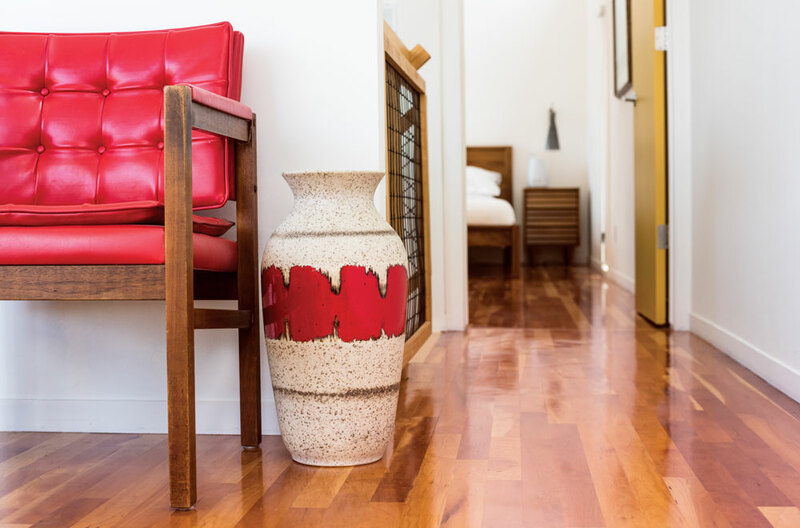 Even though the couple might be purchasing items with purpose for their home, they know when to dedicate their time and energy to something spectacular. While in New York during a year-long trip around the world in 2012, they spotted a “ginormous rug” at a flea market. Hand-woven and more than 20 feet long, it was an Amish rug, they were told, that likely was made to run along a very long hallway. They knew they had to have it, despite its sheer size and weight. 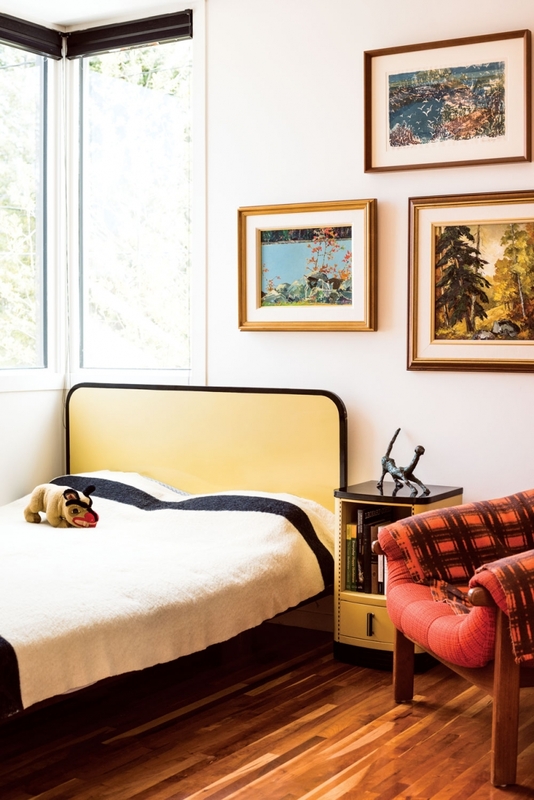 After lugging it across New York City in a big IKEA bag and taking it back to Calgary in their luggage, they hung it from the top of the vaulted ceiling in their living room. 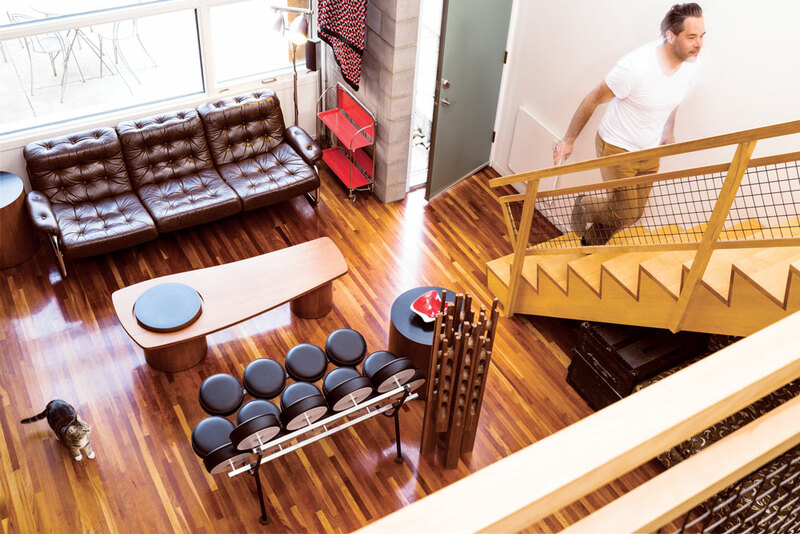 Homeowners Capri Rasmussen and Jason Auch (pictured) are big fans of mid-century design. Classic furniture pieces fill the contemporary space. Homeowner Capri Rasmussen at her Bankview home. A cutout in the kitchen keeps sightlines open. 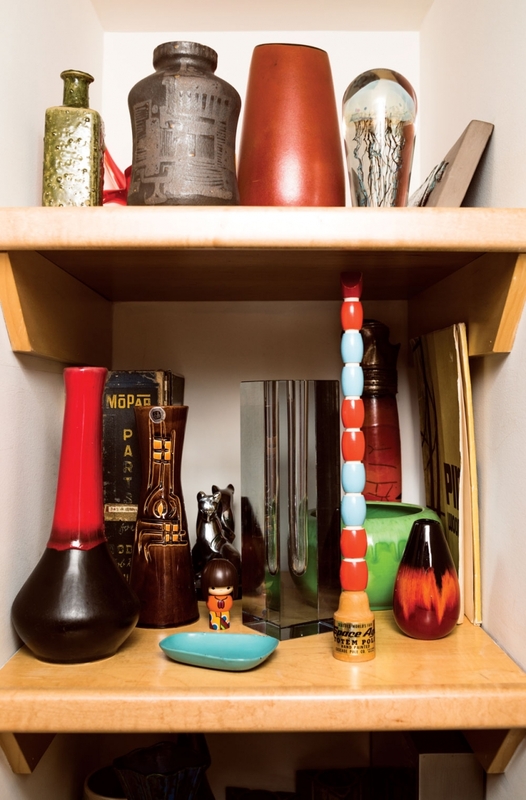 Rasmussen’s collection of Shafford cats sparked a lifelong love of mid-century design. 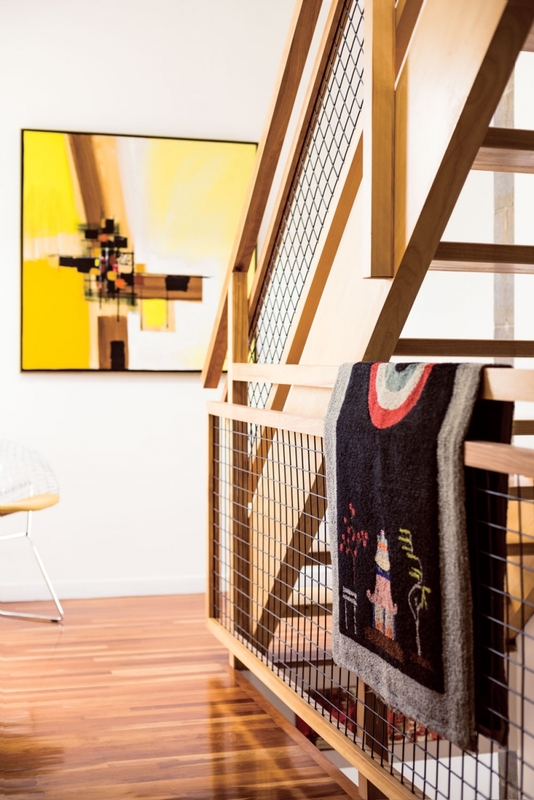 The home is dotted with the couple’s collections and innovative uses of storage space in the small footprint. Guided by constant wanderlust, Capri Rasmussen and Jason Auch enjoy travelling around the world any chance they get. 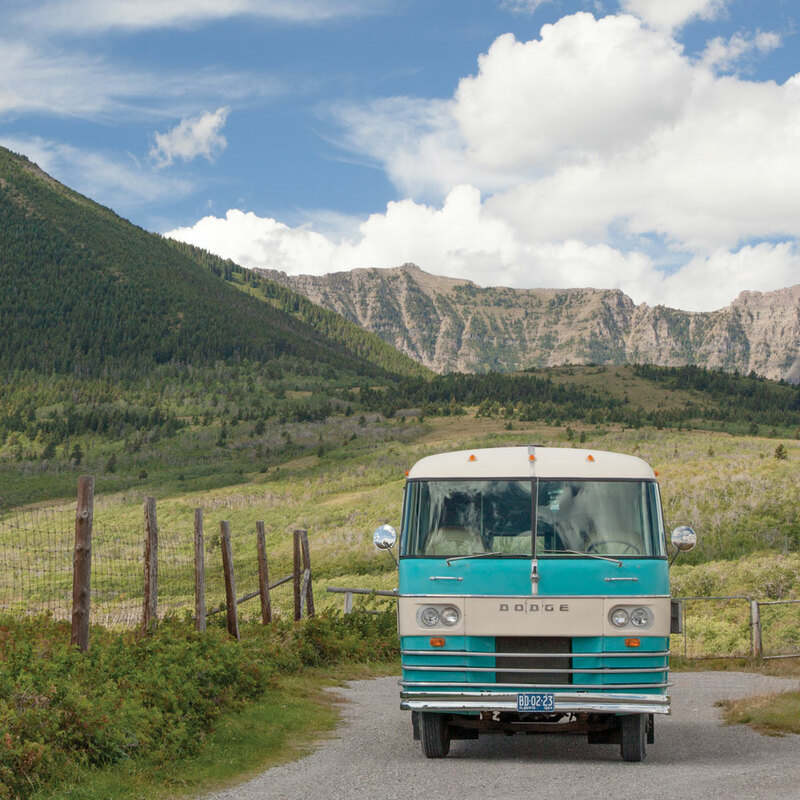 Although they’ve had the opportunity to go to a number off-the-beaten-path destinations (they recently returned from a trip to Jordan and Israel), their most treasured vacations have been spent right here in Alberta on board their 1963 Dodge Travco motorhome. Affectionately named Myrtle the Travelhome, their house on wheels has a persona of her own and even has a blog and Facebook page dedicated to her travels. The 27-foot, turquoise-and-white fibreglass motorhome, with a full kitchen, bathroom, bedroom and living area, stands out in a crowd. Rasmussen and Auch have kept the original design integrity alive in Myrtle’s interior and even stocked her shelves with completely vintage items, including Melmac dishes and a hand mixer, all of which come in handy when they hit the road for the weekend. 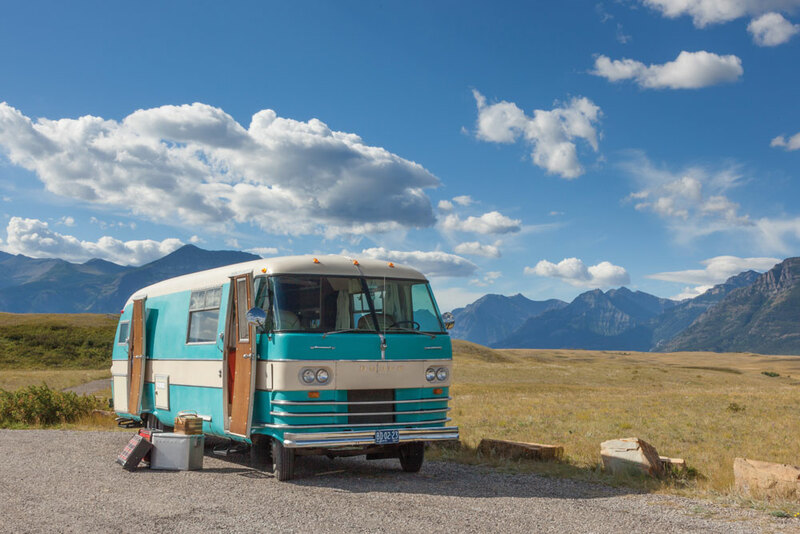 Now completely immersed in the culture of vintage trailers, the couple has kept incredible records of Myrtle’s history and has amassed vintage brochures, manuals and advertisements chronicling the innovation of other motorhomes. Rasmussen has become somewhat of an online resource, as she carefully scans and uploads the vintage paraphernalia for other enthusiasts to her blog, myrtleandme.blogspot.ca. 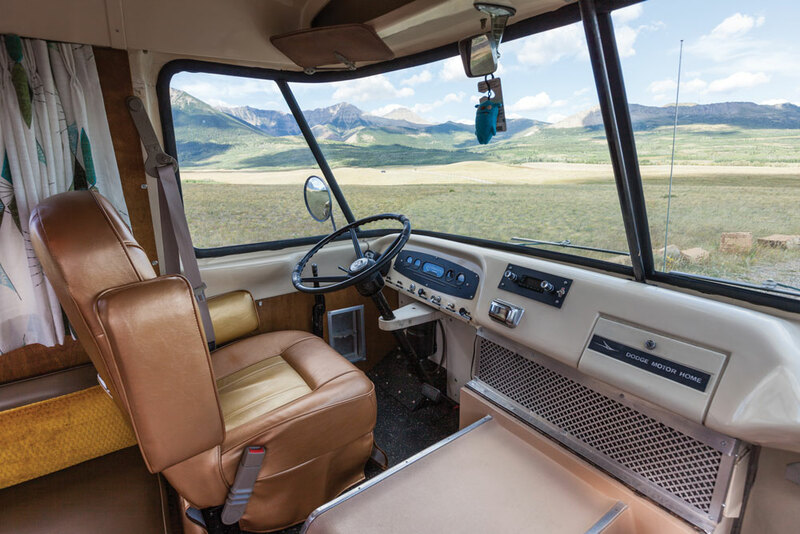 Rasmussen and Auch’s 1963 Dodge Travco Travelhome, which they’ve affectionately named Myrtle, is a head-turning mode of transportation for the couple’s getaways. The couple stayed true to Myrtle’s vintage roots when refurbishing the motorhome. Vintage motorhome enthusiasts all over the world visit Rasmussen’s blog, myrtleandme.blogspot.ca, to read about their adventures and learn about vintage motorhomes.